29" x 54" x 26.5"
Here we have a fine Rosewood Library table with two drawers. 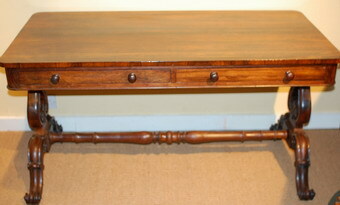 Standing on finely carved cabriole legs with castors and a turned stretcher between. A good size, would fit neatly behind a 3 seat sofa or against a wall. Alternatively this would make a very comfortable office desk. The drawer fronts are both sides, one side the drawers can be used, fully extended, the other side they are 'dummy' drawer fronts. This item does not include free delivery but can be collected in most estate cars. Delivery can be arranged. Please come and see this in our shop showrooms.